SBAH and the Iraq Museum were victims to the bombing of the Foreign Ministry last week. Many of the glass windows were broken, part of the roof of the children’s nursery collapsed, fortunately there was no fatality, just bruises and minor injuries. One of the accounts was at the Ministry of Finance when it was also bombed, he was injured and taken to hospital. I understand some of the exhibited antiquities in the the Museum were also damaged. I hope they have already been photographed. Worrying issue, I heard that most of the staff ran away. Was there any emergency plan to deal with this kind of situation, such as the closure of all the doors, particularly the ones leading to the Museum and the storerooms? Apart from the police guards, is there a team whose duty to take charge whenever the Museum is under threat? Prof. al-Gailaini Wehr raises a very important question, one that it is to be hoped will be asked as well by all those who wish to help the Iraqi government do what it can to secure the museum for a future that may well involve more bombings and even, god forbid, a breakdown of civil order on a much larger scale. Until now, the State Department has blithely pursued a Pollyannish policy that has ignored repeated warnings by archaeologists that it was too dangerous to reopen the museum. Instead of focusing on security for the museum (or archaeological sites for that matter), we have acceded to the Maliki government's desires to use it for propaganda purposes as a symbol that things are returning to normal. 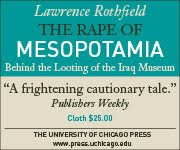 As part of that fantasy, US money has been plowed into site assessments, sustainable tourism planning, and training for archaeologists -- all good ideas but surely secondary in importance to the need for far better protection of Iraq's cultural heritage against looting and bombing. If the report of damage to exhibited artifacts is true, our negligence has once again borne bitter fruit, albeit on a much smaller scale than the looting of the museum and archaeological sites in the 2003-2007 period. As the U.S. forces look toward our draw down out of the country, this is a great potential legacy that we can leave behind; showing that we took proper care of the ancient sites and history of the Iraqi people. When the security situation arrives at the point when there is an opportunity for wide-spread tourism, our good stewardship of these sites will pay off because we will have met the immediate needs to preserve these sites now. The danger is that if we do not recognize that taking proper care means worrying about security first and foremost, the legacy that we leave behind will be of a country whose heritage remains inexcusably vulnerable.Let us hope that we learn from it and refocus our cultural policy in Iraq. Harper's has a nice review of my book in the just-out September print issue (the review unfortunately is available online only to subscribers). “[What] would it be if, in order to know the art, you always had to go to Greece, to know Mesopotamian art you had to go to [the Middle East]?” de Montebello asked. “What kind of a world would that be?" Yes, and what kind of world would it be if when you went to the Middle East you found thousands of archaeological sites missing their artifacts? I'll be giving a keynote address at this meeting in London Friday Sept. 18 at 1:30.